Pastor at The House of Yahweh writes new article this week exposing a movie-like plot of righteousness versus evil, only he says it’s real and playing out now. 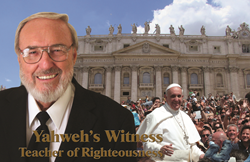 Yisrayl Hawkins, Pastor and Overseer at The House of Yahweh in Abilene, Texas, has released a new publication this week he says will expose the true righteousness versus evil in today’s religious showdown. Yisrayl says the publication titled “Yahweh’s Witness versus the Lords and Gods” is written to warn, expose and to reveal religious “secrets” never before understood. He promises to leave the reader in shock and awe in the 31-page post. “There is a very real showdown of righteousness versus evil playing out right now, and most people don’t even realize who the players are. Well, now they will,” Yisrayl promises. Yisrayl opens up the dialog with biblical history surrounded with scriptural facts that he says has led up to the ultimate showdown. He explains there has been a spiritual battle taking place behind the scenes for a very long time, but it is now spilling into public view, and they need to know what’s going on. “Prophecy is so specific and detailed, there is just no way a person could doubt it once they have all the details. You’ve got to check this out and see who these religious figures are and who comes out on top,” Yisrayl adds. Yisrayl parallels this religious showdown with many of the biblical prophets who faced similar adversity, only this time, he says, the evil forces will not prevail. Although this sounds like something you would see only on the Hollywood big screens, Yisrayl promises this is real-life, and something the world needs to know about. He says the deception is great, sin is at an all-time high, and people need to know where they’re truly coming from. To read about this, go to http://yahwehsbranch.com. The House of Yahweh, fully recognized in 1983 as a non-profit organization in the United States of America, continues to fulfill its commissioned work of preaching and publishing the True Message of Salvation. The House of Yahweh has correctly restored the Heavenly Father’s and the Savior’s True Names in the translation named in Scripture as The Book of Yahweh.